Traditionally, drapes have been a crucial part of completing the interior design of a home. Believe it or not, as outdoor living spaces become more popular, custom drapes have also become important to the design completion of the exterior living space! Our outdoor fabrics at Outdoor Drapes are designed to decorate and define outdoor living spaces such as patios, outdoor rooms, screened porches, terraces or poolside cabanas. Our custom outdoor drapes provide shade without blocking the breeze and create an ambiance that will transport you to another place. 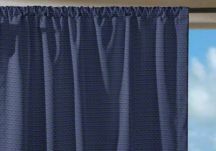 Our custom outdoor drapes are woven of resilient solution-dyed acrylic that is sun and soil resistant. This quality helps your drapes weather the elements while providing a gracious setting for outdoor entertaining. We feature Glen Raven's Sunbrella furniture grade outdoor fabrics in a variety of solid, stripes, and patterns to fit your style and design needs. 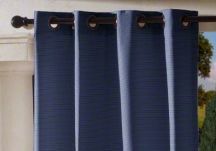 Choose from rod pocket drapes, grommet drapes or tab top drapes to fit your drapery needs and style. If you are searching for indoor drapes or silk drapes, we offer those as well! We offer hundreds of indoor fabrics and a variety of silk colors to customize your indoor drapery needs. We look forward to making beautiful custom outdoor drapes for your home! 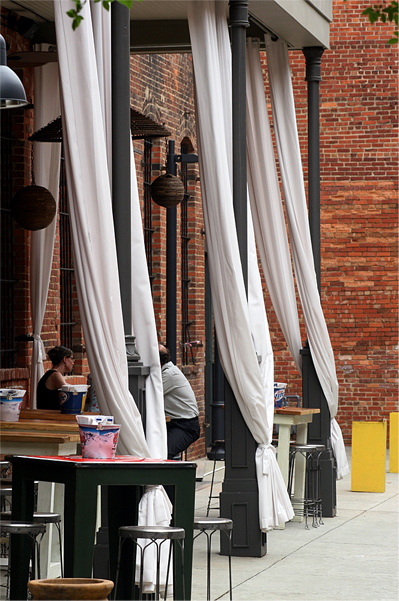 Check out our latest install of outdoor drapes at a restaurant in Montgomery, AL pictured to the right. 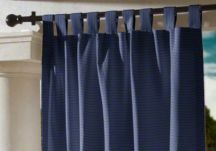 Their patio is accented by these beautiful Sunbrella Natural grommet drapes.